Members of the cast of The Ridiculous Darkness. Photo by Wendy D Photography. 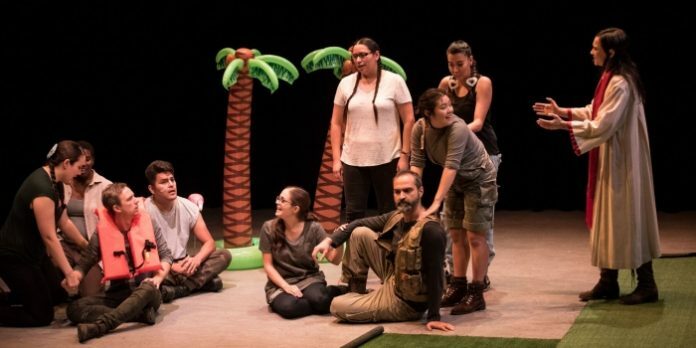 With an intended satirical mash-up of Joseph Conrad’s novel Heart of Darkness and Francis Ford Coppola’s Vietnam War film, Apocalypse Now, The Ridiculous Darkness has all the hallmarks of a potentially stimulating and thought-provoking piece of theatre. 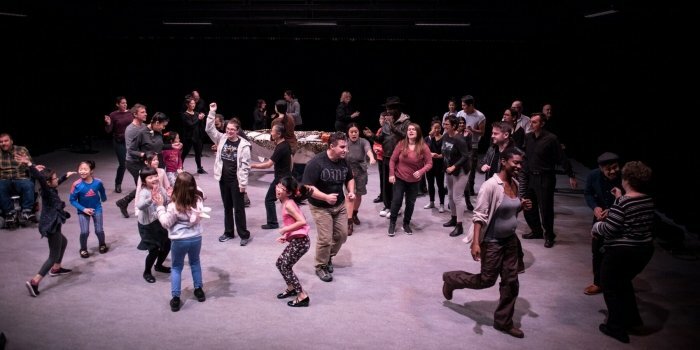 So why doesn’t the Alley Theatre and Neworld Theatre co-production, currently on stage at The Annex in Vancouver, work? Part of the problem may be in trying to serve too many masters. The first, and arguably the most important is German playwright Wolfram Lotz’s story. Originally a radio play Lotz, he has given stage adaptations, such this one by Alley Theatre’s Daniel Arnold, great latitude on how it is interpreted. Arnold has embraced the playwright’s generosity, in both expanding on the central story to provide a local flavour, and in allowing his six actors to interchangeably play the main characters. More on the Vancouver connection in a moment, but in allowing the players to switch central characters multiple times, it adds to the confusion of an already complex story. With those same actors playing a multitude of other roles over the course of the show’s nearly three hours on opening night, it was at times near impossible to keep up. While it may have seemed clever on paper, the result is too many voices interpreting characters, rather than allowing more unified and natural character progressions. Despite an overall confusion, there were thankfully some moments of real clarity. Unfortunately they were fleeting, largely arriving in scenes where the satire was in full force. More-often-than-not though, those moments where the satire really takes hold are bookended by very long scenes as Sargeant Oliver Pellner and his sidekick, traverse the river in search of their goal. The Ridiculous Darkness includes a number of Vancouver community groups. Photo by Wendy D Photography. The second master is the local community groups who have been enlisted. While a laudable goal, at times these groups felt forced inside Lotz’s story. There were also a number of uncomfortable moments with the younger ones on stage, especially given the very adult language and subject matter. At times these community groups would also step outside the story in an effort to either contextualize their existence, or to introduce more local content. One example is in the inclusion of the Japanese-Canadian internment during World War II as seen through the eyes of Tetsu Taiko. Another comes from the performance of the East Van Powwow Crew, where the full impact from the sheer absurdity of their appearance is lessened by immediately taking them out of the story itself by introducing yet an other incongruous element, a poem by East Vancouver spoken word poet, Zaccheus Jackson. Additionally, these breaks not only interrupted momentum, but at times felt very much like PSAs. While one can appreciate the performances and messages from these community groups, they rarely served the story. That isn’t to say these incursions didn’t always work, but the ones which did were fully integrated into the story itself. One such scene was the juxtaposition of persons with disabilities against the slave labour used to mine coltan, an ore used in the manufacture of our mobile phones. There is no denying The Ridiculous Darkness is an ambitious project. One only needs to scan the show’s program to see just how many people it has taken to bring it to the stage. But in serving too many masters it has lost much of if its potential satirical impact. The Ridiculous Darkness based on a radio play by Wolfram Lotz, translated by Daniel Bruent, and adapted for the stage by Daniel Arnold. Originally adapted from the Francis Ford Coppola film Apocalypse Now, and the novel Heart of Darkness by Joseph Conrad. Directed by Marisa Emma Smith and Nyla Carpentier. An Alley Theatre production in partnership with Neworld Theatre. On stage at The Annex (823 Seymour St, Vancouver) until November 19. Visit http://alleytheatre.ca for tickets and information.